My seasonal table for everyday. Holiday season is upon us. Do you have grand plans? Do you get excited or freaked out? I get invigorated, I feel a sense of renewal. A feeling of winding down after an exhaustive summer. Time to settle in, get ready for hibernation. Set a fire, do some knitting, make soups, pull out the blankets and down comforters. I’m so ready to nest. It’s also my busiest time. Lots of aprons and napkins to be made, markets to sell at. Usually I work at 3 to 4 markets. I end up missing a lot of fall festivities. I always want to host a Christmas holiday gathering and fail at that. Too much to do and too exhausted after doing it. So this year I’m doing 2 markets and focusing on online sales. I hope to achieve my holiday party dream. It doesn’t even have to be a party, but a gathering. Holiday decor is already all around us. It’s not Halloween and Christmas decorations are available. I read somewhere the earlier you set up your holiday decor the happier you will be. Nah... I’m a true believer and stickler for no decorations until after Thanksgiving. So will you set up and decorate before or after Thanksgiving? You can always ease into it. Blend fall into Thanksgiving Into Christmas. Or maybe just have some simple decor to add some festiveness to your home. Enjoy the season. Bring the outdoors in. Here are some of my favorite ideas so far that I’ve seen. Starting from the top: Better Homes and Gardens. This looks like a Thanksgiving or dinner party table but so much to choose from that you can add to your table for everyday. Head to the farmers market or the woods for a walk. There is eucalyptus, fall foliage, and other dried autumnal flowers. The second photo I feel terrible but I can’t remember where I saw it. It was on Instagram. I will continue to search. What I loved about this were the brown sunflowers and astramaris, a candle and a mini pumpkin. The last photo is from Cottage Farm on Instagram, based out of New England. Krissy is a photographer, writer, stylist and cook. Her photos are so beautiful and peaceful. Very inspirational. 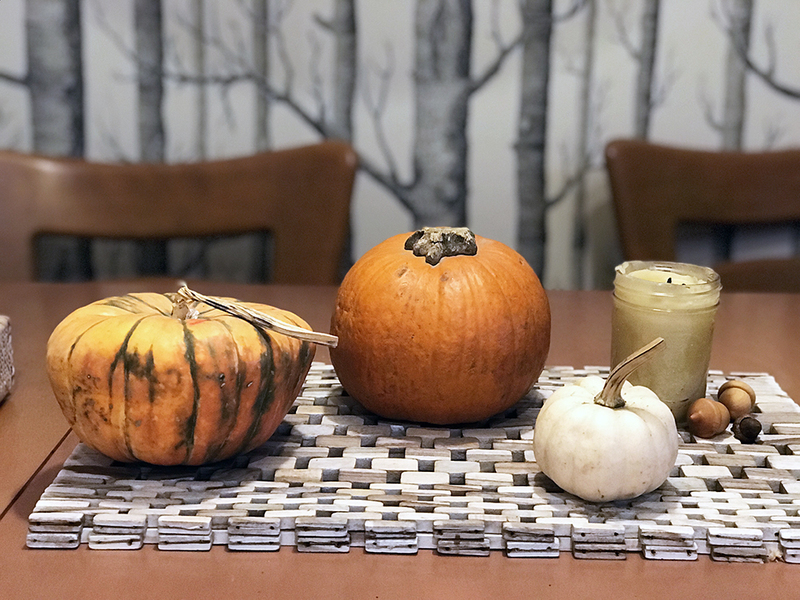 Possibly my favorite, a linen tablecloth in it’s natural hue, some walnuts loosely arranged, a grey pumpkin gourd and a few candles. Simple and rustic. She has a new baby, I don’t know how she does it all. I find myself constantly struggling with a 5 year old and trying to build a business and live life. But I digress…. Starting at the top, One Kings Lane. a online retailer and a blog I really enjoy. I would love this attached indoor dining area. What’s on the table, a few varied vessels with fresh flowers or branches from your yard. Below this, is from Instagram called Troutbeck, a well curated country house in upstate NY in the Hudson Valley. What can we take from this one? A burlap runner onto of a floral table cloth in fall colors. A few green vessels (good use for old bottles) with herbs and flowers in them and one main centerpiece which looks like a candle lantern. Green napkins that don’t exactly match but still look lovely. It definitely has an outdoor feel. Once again bringing nature indoors. I hope you found some inspirations. If you did I would love to see what you come up with in your home!